Dortmund – After Saturday evening's eye-catching 4-0 win over Borussia Mönchengladbach, Borussia Dortmund defender Mats Hummels had a job on his hands trying to keep everybody's feet on the ground. The German centre-half discussed why not too much should be read into BVB's Matchday 1 triumph, insisting that there is still a lot of work to be done for them to celebrate a successful season. Question: Mats Hummels, you said before the game that BVB had improved a little. Could that possibly have been a huge understatement? Mats Hummels: Maybe it looks like that today, but this was just one game and nothing more than that. We know we've made a good start to the season and obviously we're happy with that – with the result and the way we played – and so we should be. But at the same time, it was only one win and if we don't beat Ingolstadt next weekend, then we'll not be happy with our start to the season and this 4-0 will not be worth much. We've just got to make sure we don't sit back and relax now. Question: Were you nevertheless not impressed by the dominance you showed in this game? Hummels: If we play to our full potential, as we did most of the game against Gladbach, then we know that we can play like this. Our aim is to do that regularly. We want to dominate as many games as possible and make sure we're not reliant on luck or misfortune. We've largely done that in our games so far, although there were times against Wolfsberg and Chemnitz when we weren't at our very best. Overall, though, we can definitely feel things are going in the right direction. Question: Some of the moves, like the one which led to the opening goal, looked like they were planned – is that a fair impression? Hummels: There are a few things we've worked on, but not everything. The move which made it 1-0 wasn't necessarily something we'd planned. You get situations like that in games and you always know where Shinji [Kagawa] or Marco [Reus] are going to run, but it's very rare that you can put together a move that you've practised. It's the result of movements that you train but the situation in the game dictates which pass you actually play. Hummels: We managed to get in front of goal because we spotted the gaps well and put players there who are dangerous in front of goal. It all just came together. We were strong at the back too, which is great. We also tried to keep things going right to the end and not sit back, not only to ensure we won this game, but to keep us on our toes for our next games. Question: Julian Weigl was just in front of you. How do you think he did? 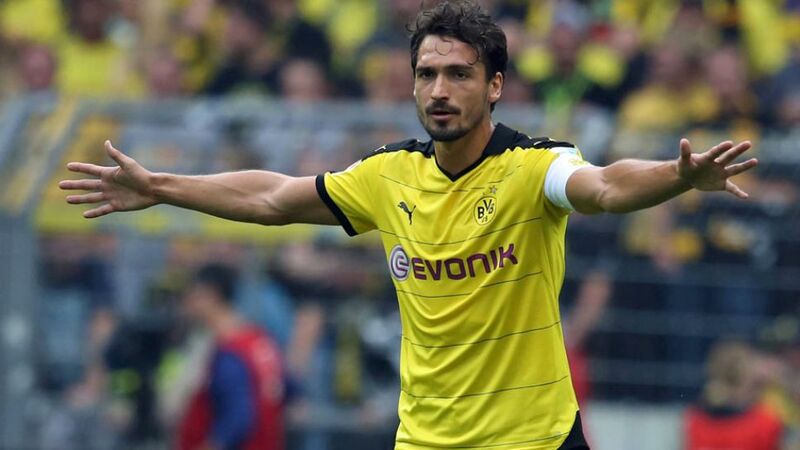 Hummels: He did a really good job, otherwise he wouldn't be playing. Jule's a great footballer. He makes things look really elegant and does his job without getting worked up and he's done a really good job so far. Question: Was this 4-0 win also a message to your rivals, to say that BVB are back? Hummels: First of all we've got to confirm that we really are back. Last year, we had six points after three games and everything seemed to be fine. Then we threw the game away in Mainz when we really shouldn't have and suddenly nothing was working anymore. We know very well that two or three good results don't mean much yet. We want to keep it up over 34 matches of the season, and preferably also in the DFB Cup and the Europa League. We're heading in the right direction, but there's still a long way to go. You can soon drift away if you just drop a few percent.